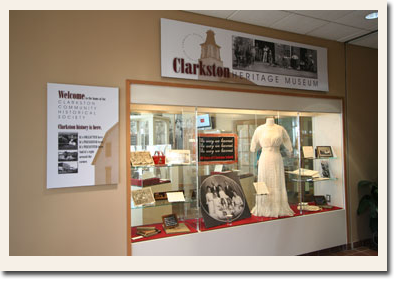 Stories from days gone by in historic Clarkston, Michigan. 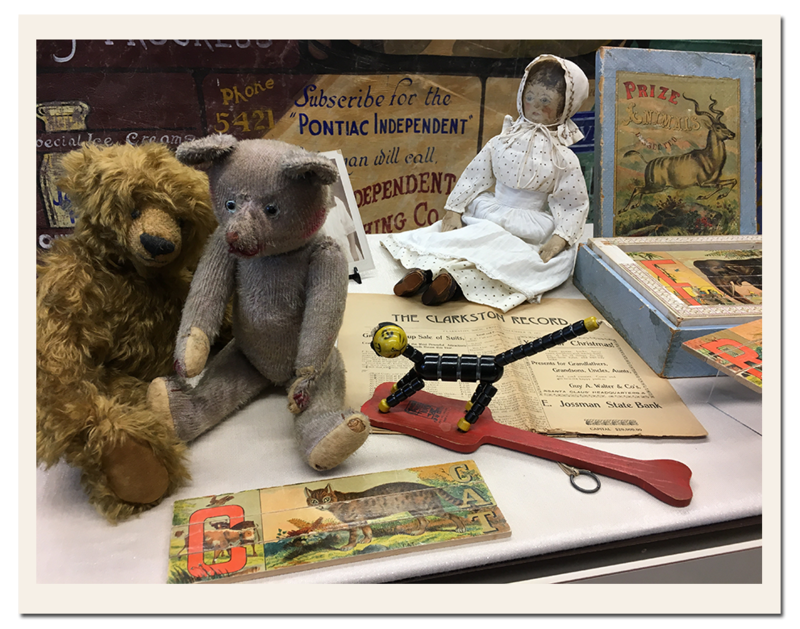 Take a look at the playful side of historic Clarkston's children. 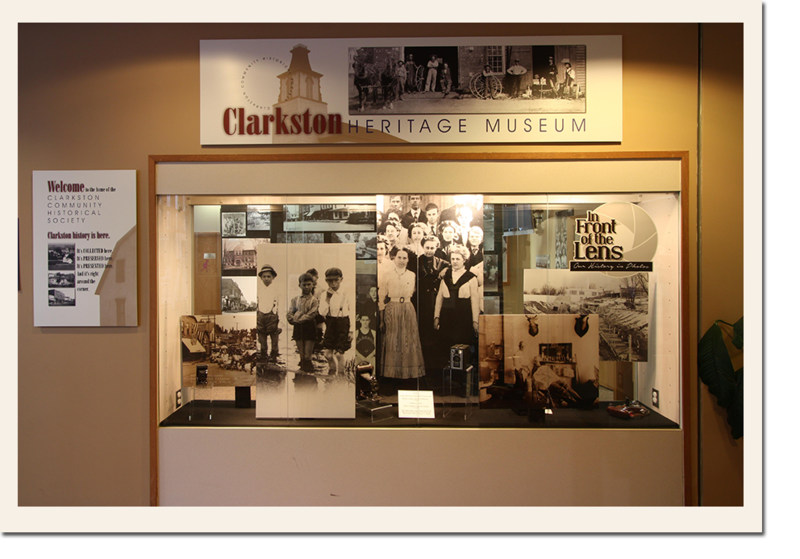 Stop by the Heritage Museum to see a gallery of historic Clarkston photos. This was our Clarkston version of Project Runway! 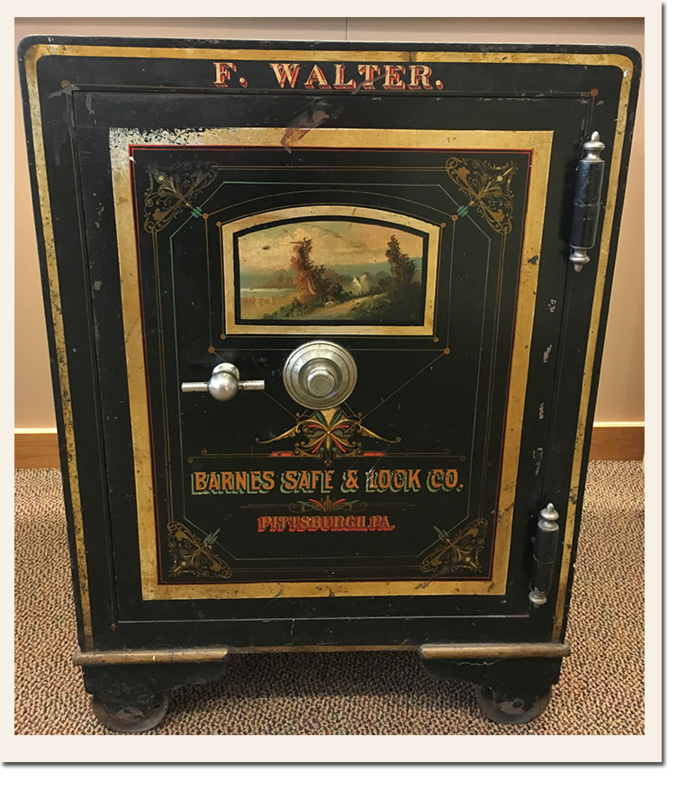 From outhouse digs to renovation surprises, this exhibit provides a glimpse at the many hidden treasures found in unexpected places. 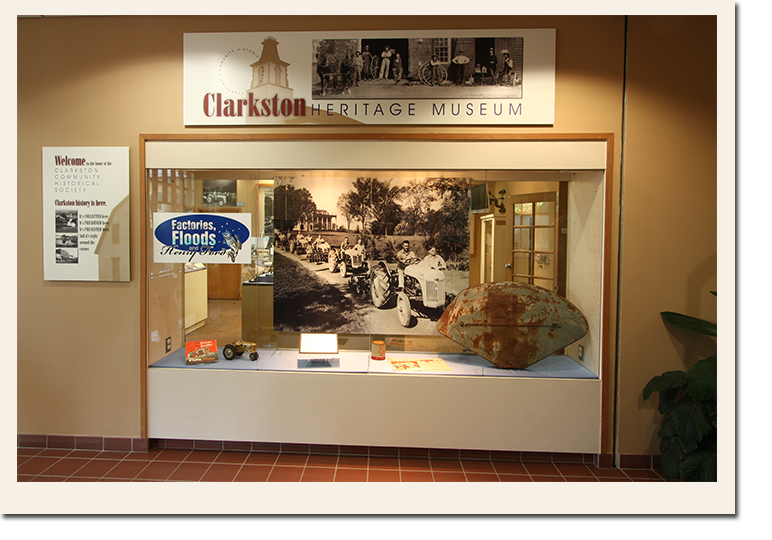 This exhibit focuses on the impact Henry Ford made on the village community of Clarkston. 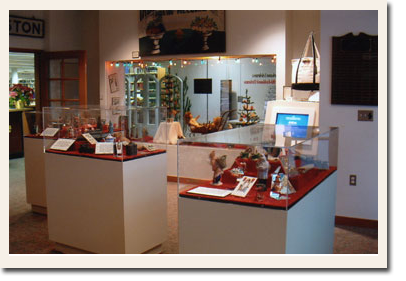 From Glee Clubs to Decoration Day, this exhibit was a true red, white and blue success. There were ballot boxes and Civil Defense helmets as well as an Uncle Sam costume and WWII scrapbook. 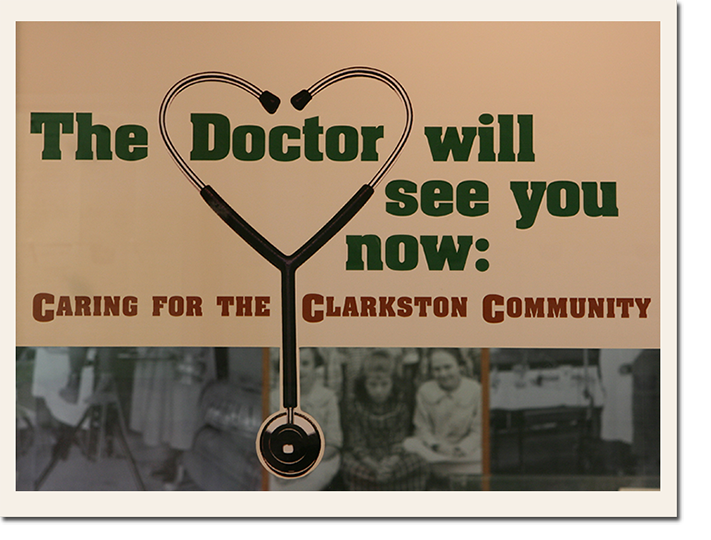 This display centered on the early physicians who lived and worked in this village community. Have you ever sat at a stoplight, looked at a busy corner and wondered “what used to be there?" Heading to town? Have you got your list? 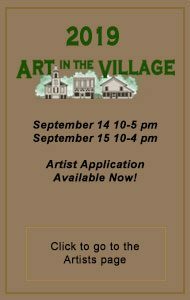 This exhibit takes the visitor back to a time when all your shopping needs were filled on a Saturday afternoon in the village. 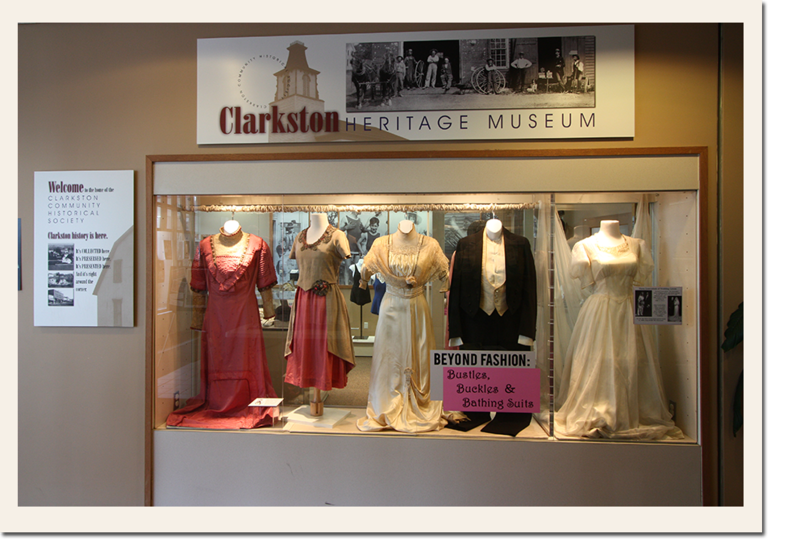 Take a walk down the aisle and experience firsthand the many stories of Clarkston brides from the late 1890s to the mid 1940s. 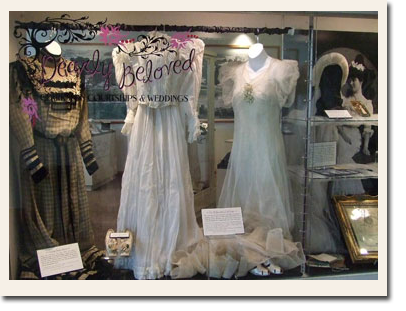 Interested in Victorian fashion? There are 7 incredible dresses here to see. 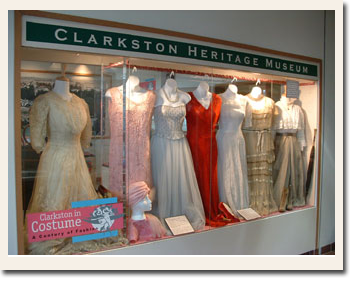 From bustles to ball gowns, you will be amazed at the dresses of longtime collector and historian, Barbara Kincaid. 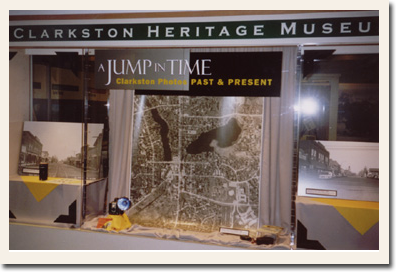 This was the fifteenth exhibit offered by the Clarkston Heritage Museum and quite different from our previous displays. 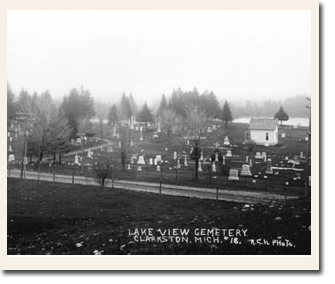 [...] we explored that time when Clarkston was a tourist town starting around the late 1800s. 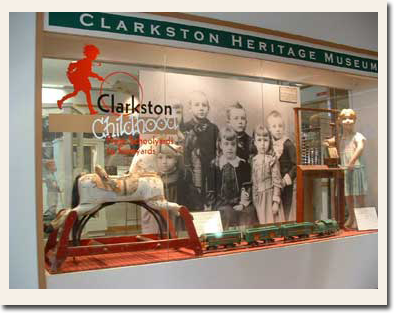 Our current exhibit tells the story of Clarkston’s youngest residents. 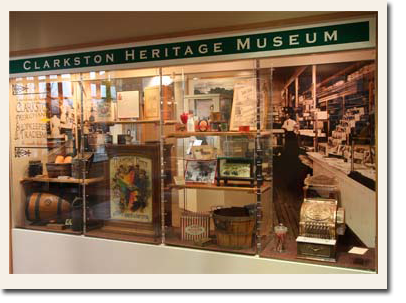 This is a fun and lively exhibit fitted with cases full of artifacts, photos and toys. 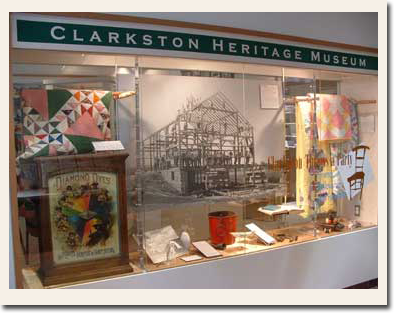 This exhibit celebrated the many different ways that early Clarkston residents gathered; from social occasions such as birthday parties and engagement suppers to functional events like a quilting bee or barn raising. This exhibit was full of texture, color, feathers, ribbons, buttons and bows! 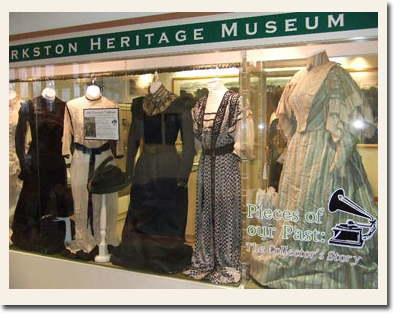 Included were several dresses representing dates from 1890, 1900, 1920, 1940 & 1950. 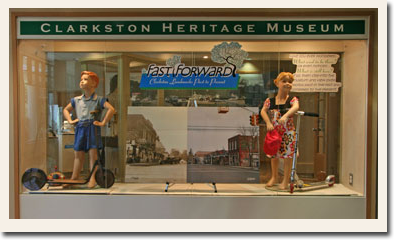 This exhibit was the first of this kind for the Heritage Museum. Rather than running for the usual 6 months, this was set up to stand just over the Christmas holidays. 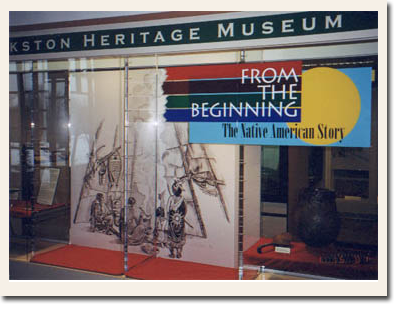 This display was unlike anything we had ever done in the past and it proved to be one of our most popular exhibits. 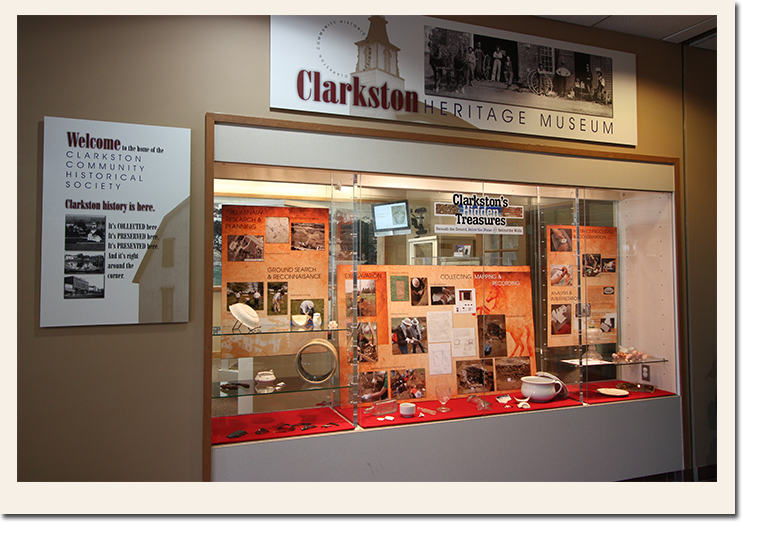 This exciting exhibit is full of a variety of Clarkston artifacts and focuses on the daily life of village residents. This was the eighth exhibit since we first opened the Museum, and a particularly timely one. 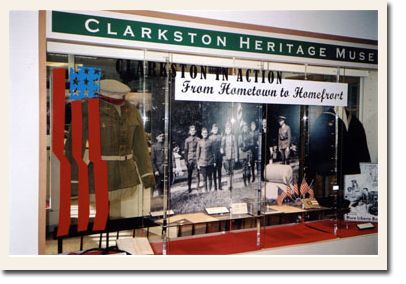 The theme of this exhibit focused on local connections to the Civil War, World War I and World War II. 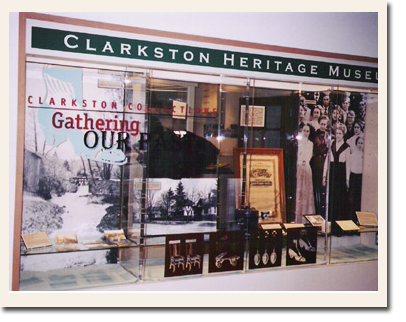 This exhibit gave the Clarkston Historical Society the opportunity to feature the many different artifacts within our general collection. 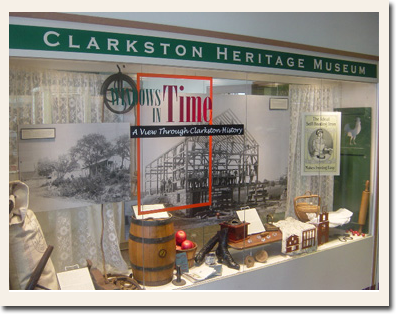 This exhibit was based on a "slice of life" theme where each display case represents a different view of Clarkston life as well as an individual who represents that same aspect. 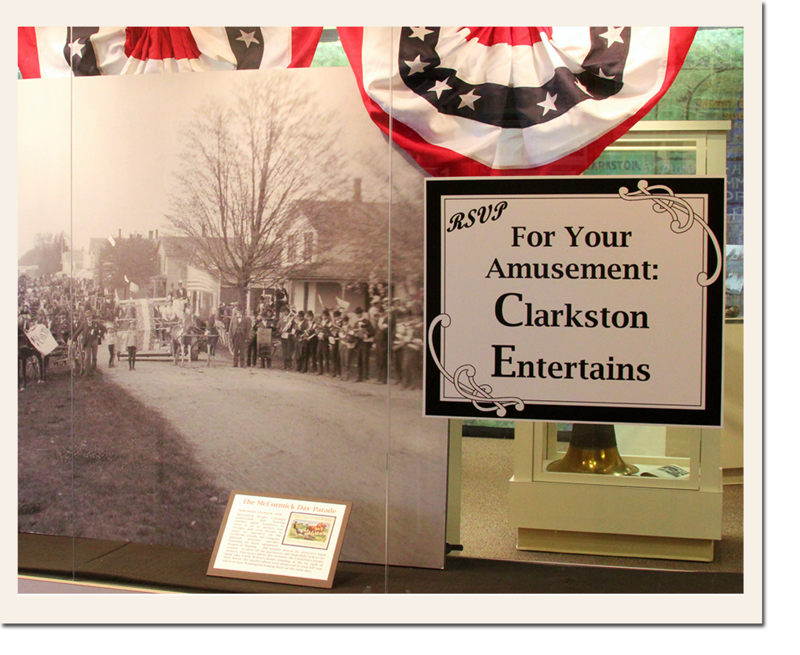 This exhibit took an in-depth look at what Clarkston's early residents did at a time when entertainment meant more than just pushing a button on the remote control! Instead, there was always the latest program at the Opera House (a nickel got you in). 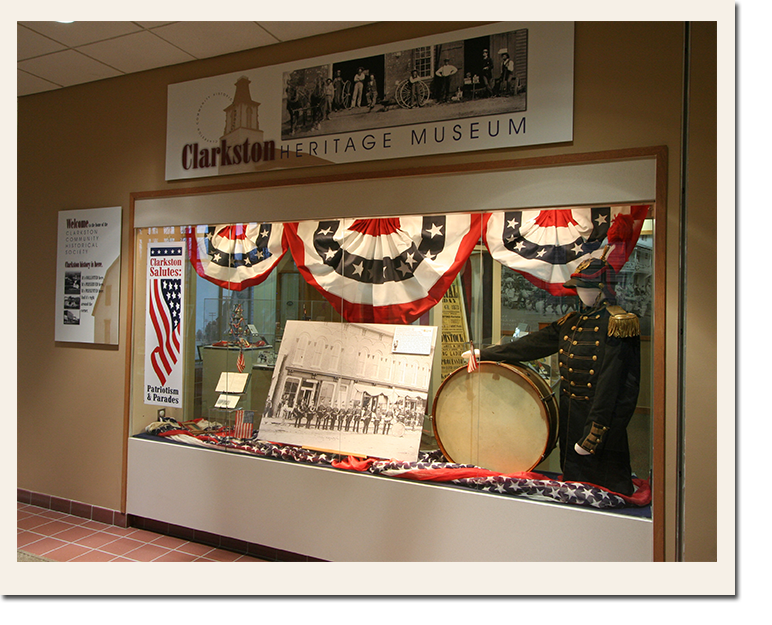 This interesting exhibit took a look at Clarkston's history from a different perspective then past exhibits. 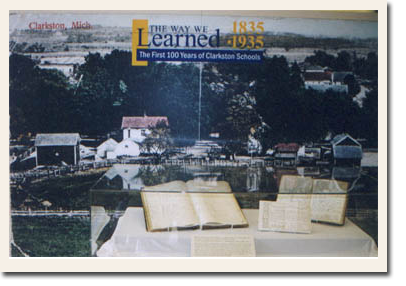 Over 40 historic photographs dating from as early as the late 1880's were displayed along side a current photo of the same scene. 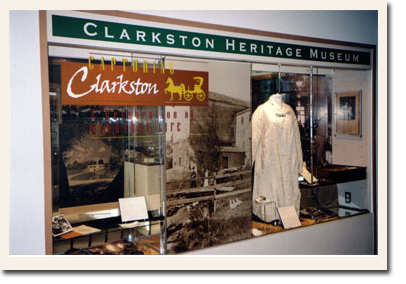 This exhibit took a step back in time to Clarkston's very first inhabitants. With artifacts dating as early as 8,000 years ago, the stone tools and handmade birch bark baskets tell us the story of a very different lifestyle. 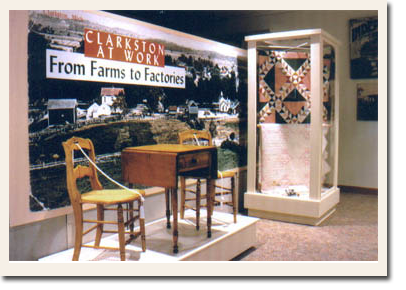 Since its early establishment, Clarkston has always been a farming community. 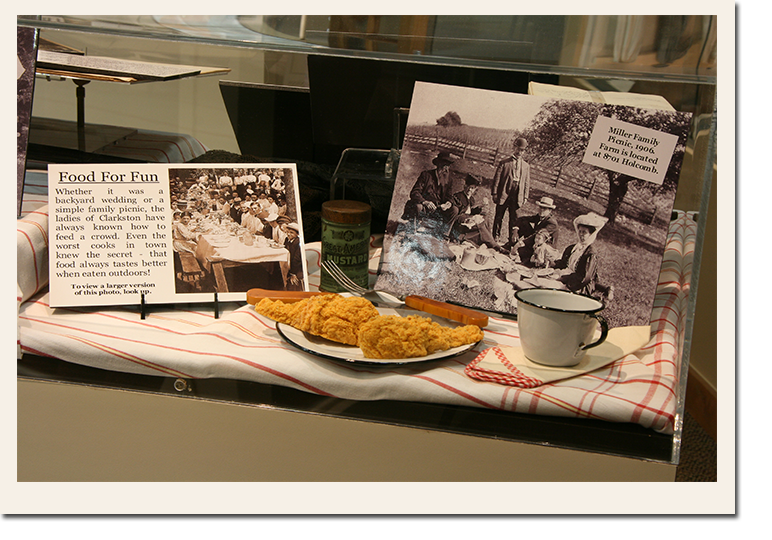 This exhibit was designed to tell the story of those first farmers and their necessary relationship to the business in town. 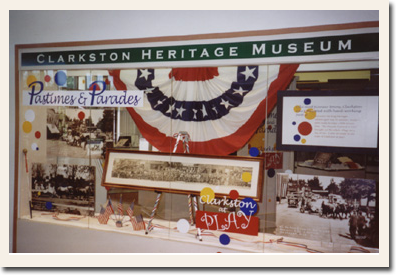 This exhibit premiered with the grand opening of the Clarkston Heritage Museum. Original materials dating back as early as 1835 included an exquisite sampler embroidered by 12-year-old Emma Adams Parker.